What if we could harness surveillance technology for forest protection? 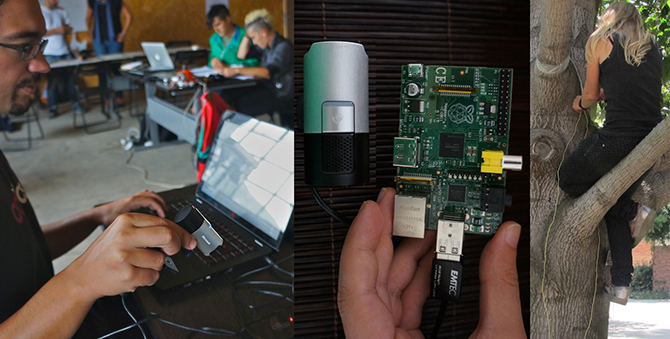 Participants are invited to assemble their own autonomous ‘forest surveillance kit’, based on the Raspberry Pi embedded computer, from common off-the-shelf parts and custom open source software, then explore the artistic and activist possibilities of the hardware. Mónica Mendes is a Digital Media artist, designer, and Multimedia Art professor at the University of Lisbon, and also an associate researcher at CIEBA and a founding member of altLab. Pedro Ângelo is a PhD student in Digital Media, founder of Audiência Zero’s LCD medialab, and an independent technical research consultant for creative projects.